It was located on a decrepit stretch of Central Avenue, also known as Central Park Avenue, between Hartsdale and Scarsdale in Westchester. “Remember what was across the street, Gerry?” Eugene said to his fellow Westchester lifer who, he thought would know such things. Gerry looked at the wild growth of green space across from the restaurant. “Carvel?” He guessed. I shook my head. 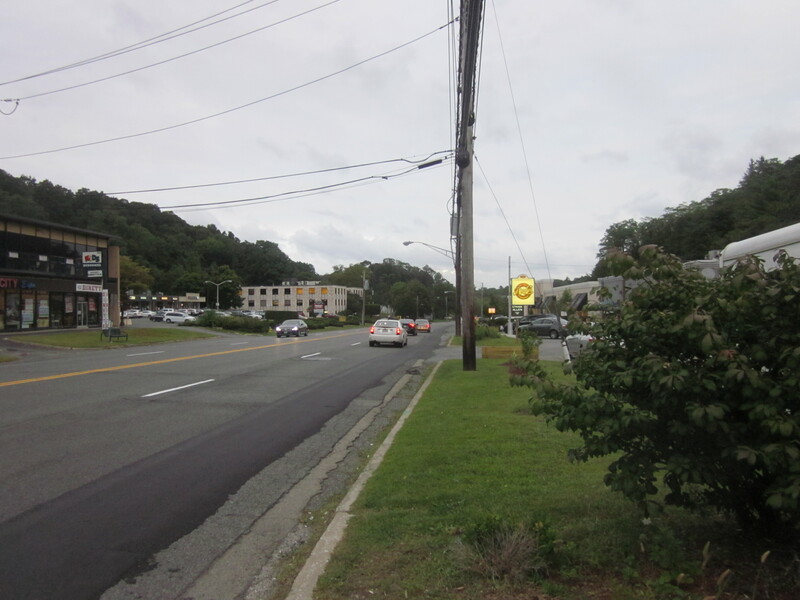 Even I knew that the Carvel, one of that ice cream franchise’s original stores, was down towards Hartsdale and I hadn’t lived in Westchester in almost 40 years. 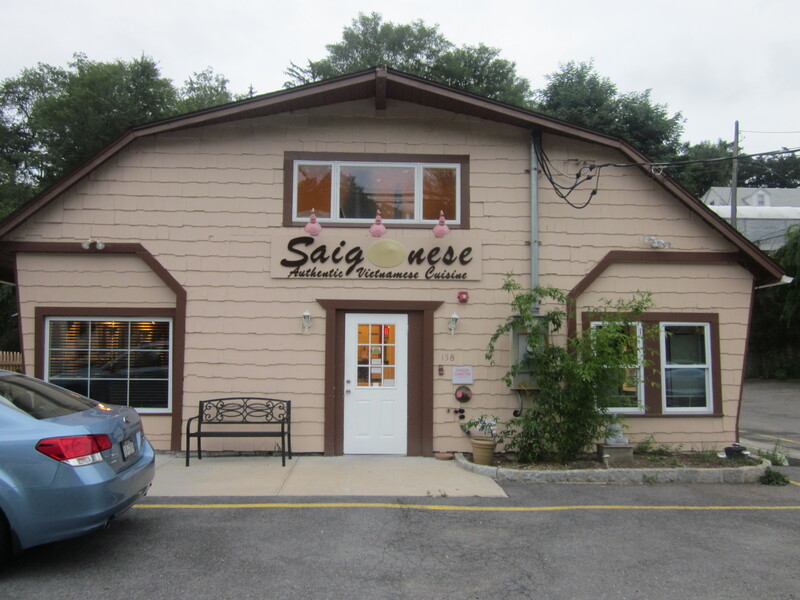 We were in the parking lot of Saigonese, the restaurant chosen by another Westchester resident, Mike from Yonkers. The small oddly-designed structure looked like a former cat house and stood out among Central Avenue’s numerous hideous strip malls. Inside the structure were an assembly of small tables; two were pushed together to make room for our party of five. Brightly lit with windows overlooking the adjacent gloomy stretch of landscape; muzak flowed from the restaurant’s sound system mirroring the dreary ambiance. But ambiance was not what our Chow City group was about. We’ve eaten in dumps without heat or air conditioning, off Styrofoam plates with thin paper napkins, but also where the food was so full of flavor, so memorable that it didn’t matter that you wouldn’t dare venture to the rest room—it was what we shoved into our mouths that counted. I was hoping that would be the result at Saigonese. “Is a summer roll the same as a spring roll,” Mike from Yonkers asked the waiter. “On the west coast they call them spring rolls,” he said. “But they are the same.” And we had no reason to doubt his knowledge of such things. 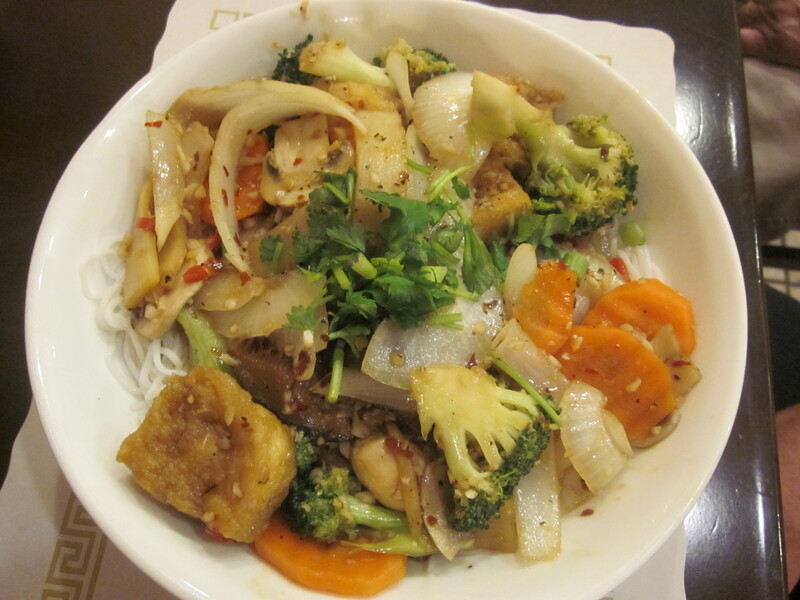 For starters we ordered the exotic Saigon rolls and vegetarian summer roll along with the grilled spare ribs and the Vietnamese crepe, Saigonese style as if we knew any other style of Vietnamese crepe. Four ribs for a party of five. First to appear on our table were four grilled spare ribs. Now a spare rib is not an easy thing to share among gluttons so I volunteered to abstain, leaving the four ribs to the others. I made up for it, however, when the ample Vietnamese crepe appeared; a large pancake stuffed with shrimp, pork and vegetables that needed a jolt of something much more potent than the small bowl of sweetened fish sauce that came with it. But there was no jolt to be had at our table. “Chili sauce,” Mike from Yonkers, called to the waiter and he responded with a house made chili sauce and a bottle of Sriracha. The exotic Saigon roll and the vegetable summer rolls arrived next. I examined them and then took a bite of the Saigon roll only to find out what supposedly made it exotic was the inclusion of Vietnamese sausage. “Pass me one of those spring rolls,” Zio said to me. “Unless we are in Los Angeles, I can only pass you the summer rolls,” I replied, but my reference to the West Coast/East Coast terminology for what was on our plates was lost on him. 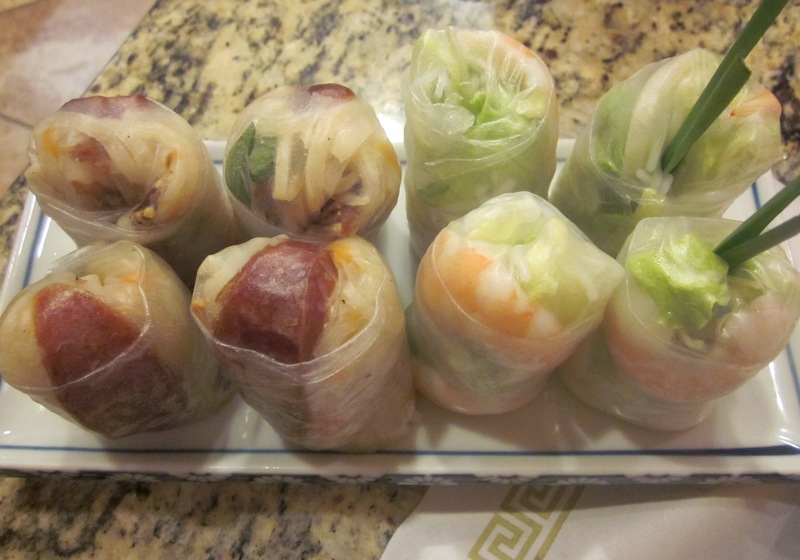 East coast spring rolls served in the late summer. Like the crepe, the rolls, spring or summer, exotic or not needed a jolt as well. I slathered one in the provided chili sauce and braced myself for a heat assault that, surprisingly, never came. At Saigonese even the chili sauce was tepid. 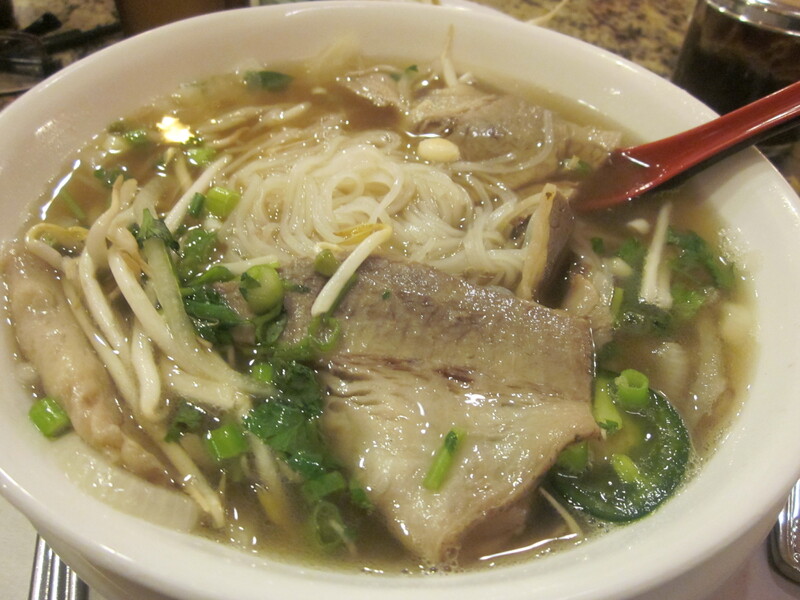 It was time to order and I had decided on a bowl of comforting pho; the traditional with beef brisket. The waiter next looked to Eugene. “Number 29,” he said to the waiter. “The house special with grilled pork and shrimp.” The waiter responded. “Yeah that one,” Eugene concurred. “Number 18,” Zio said, pointing to the number on the menu. “Grilled chicken,” the waiter recited. “The man knows his numbers,” I said. “What’s number 31?” Gerry quizzed him. “The mixed vegetables,” He replied with confidence. “Can you make it spicy,” Gerry asked. “I’ll have number 15,” Mike from Yonkers said. 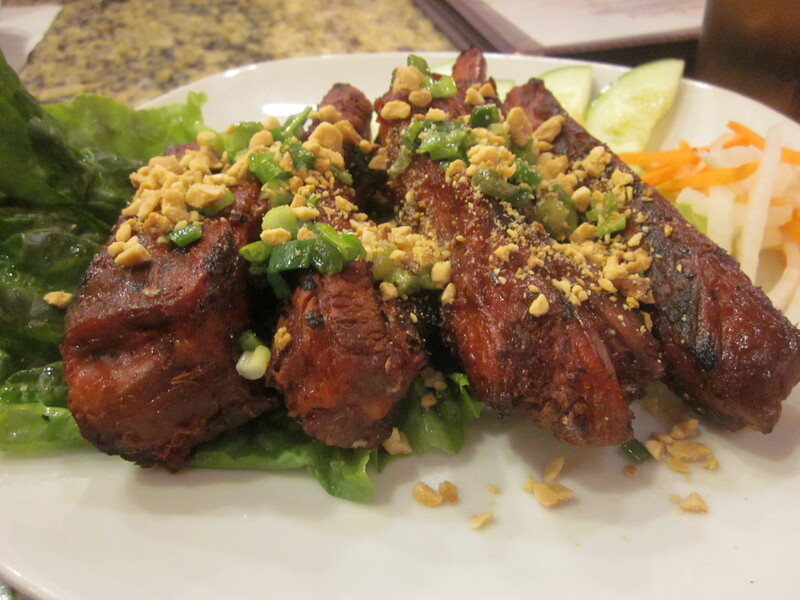 “Grilled chicken with lemongrass…” Now the waiter was showing off. The pho did offer the comfort I craved but I also wanted some zing. I stirred a few drops of the chili sauce into the soup, yet it remained comfortingly bland. “They’ve Westchesterized this food,” I announced, meaning they dumbed it down, reduced the flavor and spice to appease the local clientele. Number 31 with added spice. The lack of flavor in the dishes was more than made up for by the surprisingly very good Vietnamese flan I had for dessert. 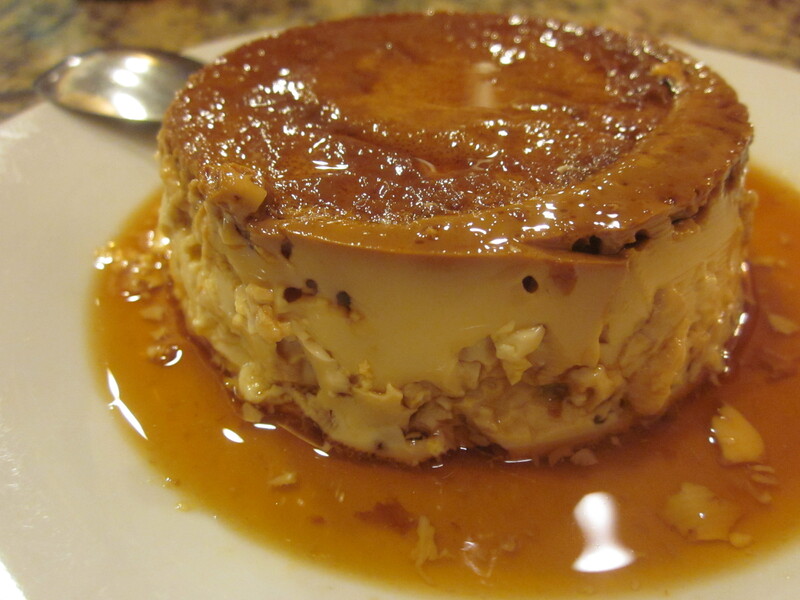 Who would have thought that flan would be the standout at a Vietnamese restaurant but at Saigonese it was. After settling our bill, we congregated in the small, now dark parking lot. I made the mistake of wondering out loud what would be the best route back to the city. “Go back and take the Bronx River,” Gerry suggested. “No, take Central Avenue and then get on the Deegan,” Eugene said. “That will take forever with all those lights,” Gerry argued. I couldn’t listen anymore and instead got into the car. I decided to pull out onto Central Avenue and take the scenic route suggested by Mike from Yonkers and Eugene. Yes there were lights, but at each red light I was able to ponder the parade of strip malls glowing with colorful neon, the national fast food chains, car dealers, drug stores, pizzerias, diners, and Chinese restaurants and wonder at all the treasures that lay within. 158 S. Central Park Ave.
Been to this place a couple of times and it is mediocre. Definitely dumbed down for the neighborhood.